Being interviewed live by anchor Jeff Flock on Fox Business News in February, 2014. The 2014 referendum question had received quite a large amount of media attention, with a featured article appearing on the front page of the Chicago Tribune, and additional coverage by the Daily Herald and Crain’s Chicago Business. I was interviewed live on the radio by several local stations, including NPR. All of this caught the eye of FOX Business News, who came to Long Grove on a very snowy President’s Day in February of 2014. 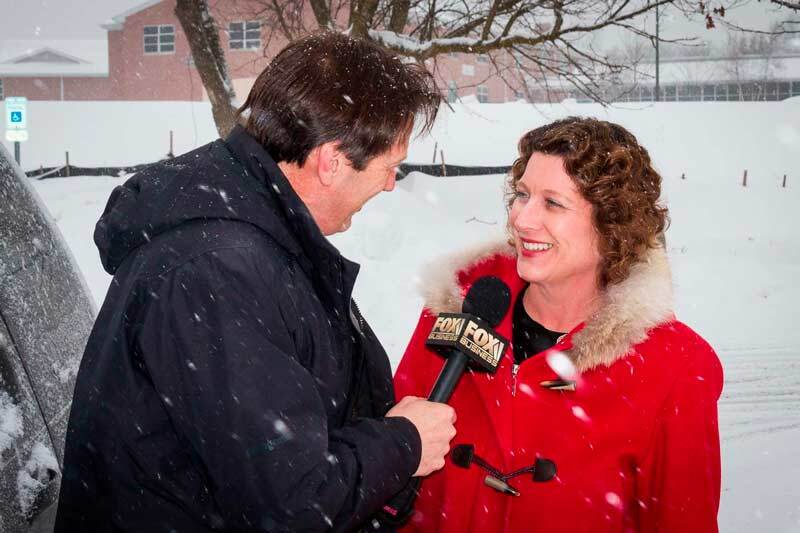 Throughout the day, as the snowflakes drifted down into a white-out blizzard, I was interviewed live for four separate segments, at different locations in the Village. The first spot was filmed in front of the covered bridge, but the subsequent three interviews were filmed live while I was driving the news team’s truck over our Long Grove roads, simultaneously answering questions, during an escalating snowstorm. I will never forget the reality TV challenge of giving articulate answers to the reporter’s questions while driving an unfamiliar truck as I pumped the brakes to stop skidding onto Route 53 and knowing that this was being broadcast live. I think I surprised everyone–staff, news crew, and myself–that I was able to pull this whole thing off and get everyone and the truck back to Village Hall in one piece. When it was all said and done I was dubbed “a real trouper” and I will say that it was a true lesson in grace under pressure!